John was my first patient. He is 65 years old, five feet tall, and likely under 80 lbs. He is emaciated, sickly, and dirty. The inside of his mouth was covered with a white film. He has Oral Thrush-often an indicator of HIV+ status. I told John we needed an HIV test. Surprisingly, he wanted to know his status, considering the stigma of HIV in Africa. Lillian was my last patient. Her mouth would not heal properly months after having several teeth removed. We took a biopsy two weeks previous. The nurse returned with John's HIV status report. What had I done? I'm a dentist not prepared to counsel John medically, emotionally, spiritually. The test was negative! What a joy to give John this good news. "I want a copy," he said, "to show everyone. The doctors always told me I had HIV. Praise the Lord!" Lillian's biopsy came back positive for multiple myeloma; a bone marrow disorder that we are unable to treat at Tenwek. Her prognosis is poor. I shared with her our findings--feeling inadequate and discouraged. We hope she can get to Nairobi for treatment. We don't know. We pray she will find treatment, and comfort in a God who can give her rest. Expect the Unexpected my college soccer coach would say. Two agreeable Kenyans, their life changed in a moment. I get to be a part of God's puzzle. Have you figured out the picture? 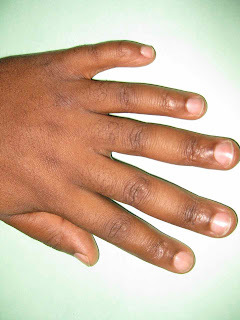 This is the hand that welcomed me to Tenwek Dental Clinic: Dr. Peter Kuyaya BDS. Wow, Malin, you are exactly who God wanted to interact with John and Lillian. You know Him > they need to know Him> He will give you the words when you need them. Malin, I was an oncology nurse for almost 30 years and I encountered my first AIDS patient in 1985. I prayed hard and Gary taught me that what was needed was a listening ear, a compassionate heart and someone who would help him understand (and eventually choose) an eternity with Jesus. You, too, can offer that. Stay faithful and lean on His understanding then just be yourself - laugh with them, love them, and try to share what will mean everything to them in the end. God Bless You, Malin Friess. I'll bet you are getting excited about Grammie's visit. May there be no unexpected along her path to you. And may God so richly bless your time together. Check out the picture....count the fingers.